These burgers pack a real punch thanks to thyme, paprika and cumin. They’re bound to go down a sizzle at your BBQ…don’t forget the ketchup! 1. Fry the onion in 1tbsp olive oil for a few mins to soften. 2. Put the mince into a large bowl, season generously and add the thyme, paprika and cumin. 3. Tip in the softened onion and mix together with your hands. Divide into 4 and form into burgers, using a plain ring cutter to help shape. Chill. When ready to cook, heat a barbecue, griddle or grill to high. 4. Gently fry the red onion in the remaining oil for 8 mins until really tender. 5. Meanwhile, cook the burgers for 8-10 mins, turning from time to time, until cooked through. 6. Add Worcestershire sauce to the red onions and cook for a couple of mins to reduce. 7. Lightly toast the burger buns, spread each with 1tbsp mayonnaise and top with a burger and red onions. 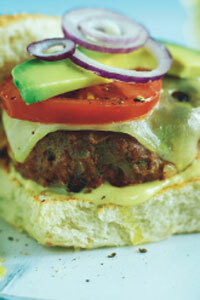 Serve the tomato, lettuce and avocado alongside or pile up in the bun, if you like.